The Smallest Art Gallery / Color Paradise Hong Kong Ltd.
Ice Gel is a professional fingernail paint brand with a great variety of colors that can create very delicate and complicated patterns, enabling women not only to embellish their hands but also show their own style and personality. Media fees and shop rentals are very high in Hong Kong. So we created the "world's smallest art gallery". We commissioned an artist to create a range of modern art pieces on crystal fingernails. Then we put the nail paintings in a tiny art gallery inside the world's smallest store, a one-foot-square "cube shop" inside a popular shopping mall with many nail salons. 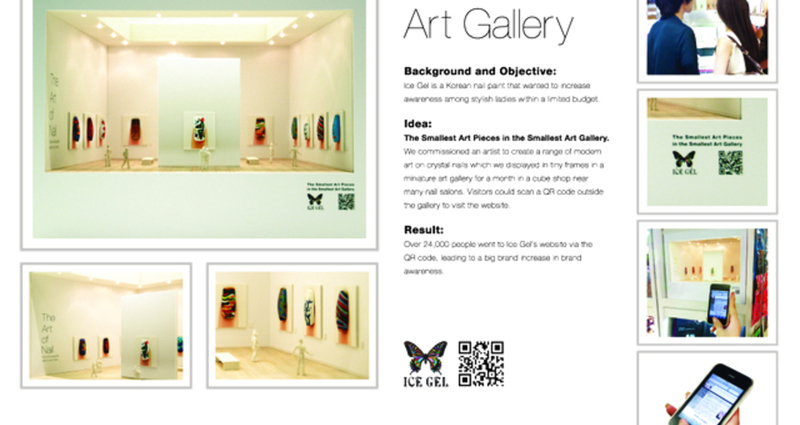 Visitors could scan a QR code on the gallery to learn more at Ice Gel's website. Color Paradise Hong Kong Ltd.